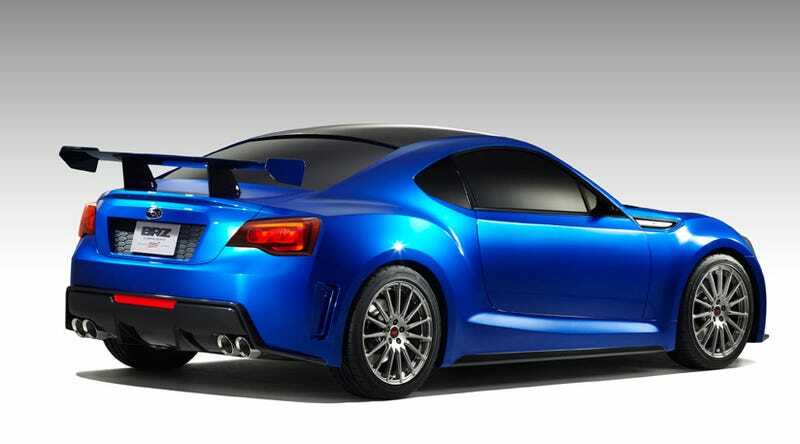 More rumors are trickling out about a purported hopped-up STI version of everyone's current favorite rear-wheel-drive Subaru, the BRZ. According to this report in Auto Express, next year we could get a BRZ STI with as much as 230 horsepower. However, as we've heard before, it will not be turbocharged. Auto Express says we could get a BRZ with a higher rev limit than 7,500 RPM, a freer-flowing exhaust and a tweaked variable valve control system. Other improvements could include grippier tires, four piston brakes, upgraded springs and dampers and bigger wheels. Lots of people like to complain that the BRZ and its identical cousin the Scion FR-S are underpowered. I suspect many of those people haven't driven the car. It's not going to melt your face off with its acceleration, but it is definitely not slow, and its revvy tendencies are not unlike the Honda engines of yore. Heck, even Jeremy Clarkson liked it a lot. But more power is always appreciated. Personally, I think 230 horsepower isn't bad at all. The WRX had that about much power for years and nobody would call it slow — and the BRZ weighs considerably less than that car. I fear that too much power would upset the car's balance and cause inexperienced drivers to end up in ditches. How much power do you think is appropriate for the car? And how much would you pay for it?